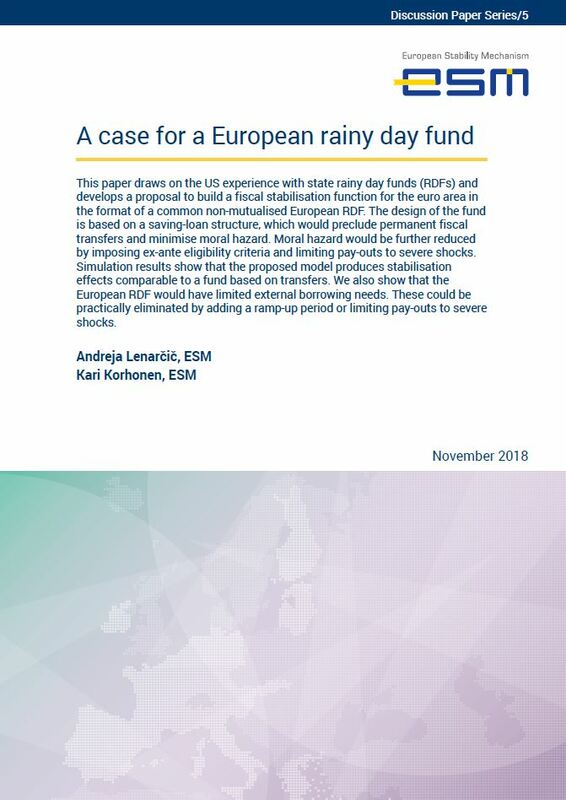 This paper draws on the US experience with state rainy day funds (RDFs) and develops a proposal to build a fiscal stabilisation function for the euro area in the format of a common non-mutualised European RDF. This paper draws on the US experience with state rainy day funds (RDFs) and develops a proposal to build a fiscal stabilisation function for the euro area in the format of a common non-mutualised European RDF. The design of the fund is based on a saving-loan structure, which would preclude permanent fiscal transfers and minimise moral hazard. Moral hazard would be further reduced by imposing ex-ante eligibility criteria and limiting pay-outs to severe shocks. Simulation results show that the proposed model produces stabilisation effects comparable to a fund based on transfers. We also show that the European RDF would have limited external borrowing needs. These could be practically eliminated by adding a ramp-up period or limiting pay-outs to severe shocks.